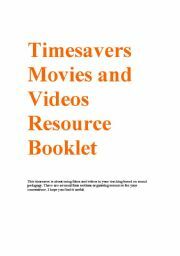 Members from time to time request information and resources about films and movies and videos to use in their lessons. 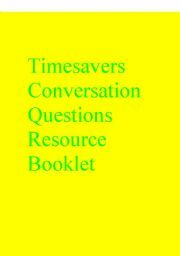 I have put together this 10 page booklet to save you more time. I hope you find it useful. 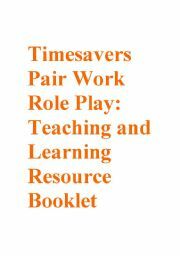 Projects are ideal for lesson extension work as well as encouraging and implementing autonomous and cooperative learning. 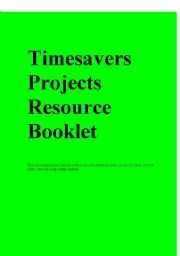 This 11 page booklet provides links and resources for projects for all level. 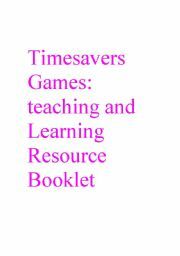 With the addition of 10 more pages this booklet on games has over 1000 games ideas and activities and should be a fantastic timesaver. I hope you find it useful. 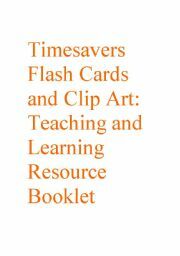 This timesaver brings together numerous resources to enhance students skills in speaking. 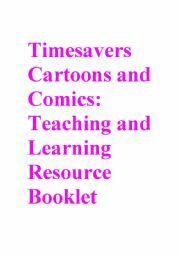 If ever you are stuck for speaking activities/materials dip into this timesaver. The usual organisation into 4 sections. 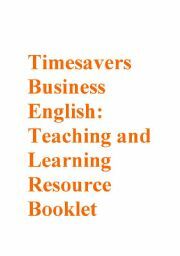 Entries are organised alphabetically for ease of reference.I hope this 13 page booklet about Business English proves to be another timesaver and useful to colleagues. Very basic Powerpoint to learn or revise furniture vocabulary. I will remove it if there is any illegal clipart.I am not 100 sure of it. This is a powerpoint to go with the worksheet also uploaded today to share ideas for giving feedback on students´ written work. This powerpoint on jobs goes with the teacher notes, jobs wordsearch and jobs pelmanism I uploaded yesterday and the other 2 powerpoint uploaded today.The presentation involves some interactive stuff as well. Hope it is useful. furniture and house and home flash cards to be used as presentation for learning useful vocabulary prior to basic conversation- pairwork - question and answer activities. 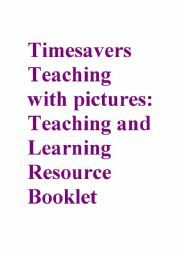 can be used separatelt or with the powerpoint uploaded yesterday on house furniture. This jobs powerpoint goes with the other powerpoint and worksheets and is aimed at A1 students. 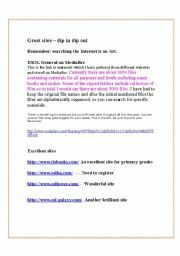 the second one uploaded today is for pre-A1/pre-Entry 1. to use them please follow the teacher´s notes uploaded yesterday. This jobs powerpoint goes with the other powerpoint and worksheets and is aimed at pre-A1/pre-entry 1 students. The second one uploaded today is for A1/Entry 1. To use them please follow the teacher´s notes uploaded yesterday.